First things first. What does HVAC mean? HVAC is in common use in the heating and cooling industry. It stands for “heating, ventilation and air conditioning,” three functions often combined into one system in today’s modern homes and buildings. Warmed or cooled or dehumidified air flows through a series of tubes – called ducts – to be distributed to all the rooms of your house. A central HVAC system is the most quiet and convenient way to cool an entire home. Unless you live in an amazingly temperate climate, the HVAC system in your home uses more energy and drains more energy dollars than any other system in your home. Typically, 44% of your utility bill goes for heating and cooling. Another development of the 1990s is the whole house approach to heating and cooling. Coupled with an energy efficient furnace, heat pump or air-conditioner, the whole house approach can have a great impact on your energy bills. By combining proper equipment maintenance and upgrades with appropriate insulation, weatherization and thermostat settings – properly regulated with a programmable thermostat, of course – you may be able to cut your energy bills in half. If you are thinking about purchasing a new central furnace, check the ENERGY STAR® database. It displays information on most energy efficient appliances in a consumer-friendly, easy-to-use fashion. Central air conditioning units are usually matched with a gas or oil furnace to provide heat through the same set of ducts. There are also central HVAC units called heat pumps that combine both the heating and cooling functions. If you heat your home with electricity, a heat pump system is the most efficient unit to use in moderate climates. It can provide up to three times more heating than the equivalent amount of electrical energy it consumes. A heat pump can trim the amount of electricity you use for heating as much as 30-40%. Even though air conditioners and heat pumps require the use of some different components, they both operate on the same basic principles. Heat pumps and most central air conditioners are called “split systems” because there is an outdoor unit (called a condenser) and an indoor unit (an evaporator coil). The job of the heat pump or air conditioner is to transport heat from one of these units to the other. In the summer, for example, the system extracts heat from indoor air and transfers it outside, leaving cooled indoor air to be recirculated through your ducts by a fan. The compressor in your outdoor unit will change the gaseous refrigerant into a high temperature, high-pressure gas. As that gas flows through the outdoor coil, it loses heat. That makes the refrigerant condense into a high temperature, high pressure liquid that flows through copper tubing into the evaporator coil located in your fan coil unit or attached to your furnace. At that point, the liquid refrigerant is allowed to expand, turning the liquid refrigerant into a low temperature, low pressure gas. The gas then absorbs heat from the air circulating in your home’s ductwork, leaving it full of cooler air to be distributed throughout the house. Meanwhile, the low temperature, low pressure refrigerant gas returns to the compressor to begin the cycle all over again. While your air conditioner or heat pump cools the air, it also dehumidifies it. That’s because warm air passing over the indoor evaporator coil cannot hold as much moisture as it carried at a higher temperature, before it was cooled. The extra moisture condenses on the outside of the coils and is carried away through a drain. The process is similar to what happens on a hot, humid day, when condensed moisture beads up on the outside of a glass of cold lemonade. The same process works in reverse in a heat pump during the winter. The heat pump takes heat out of the outside air – or out of the ground, if you have a geothermal heat pump – and it moves that heat inside, where it is transferred from the evaporator coil to the air circulating through your home. That’s not a typographical error, by the way- the heat pump moves heat from outside to warm your home, even on a cold day. That’s because “cold” is a relative term. Air as cold as 30 degrees still contains a great deal of heat – the temperature at which air no longer carries any heat is well below -200 degrees Fahrenheit. A heat pump’s heat exchanger can squeeze heat out of cold air, then transfer that heat into your home with the help of a fan which circulates the warm air through your ducts. Heat pumps are often installed with back-up electric resistance heat or a furnace to handle heating requirements when more heat is needed than the heat pump can efficiently extract from the air. We’ve just described what is called a “split system” – the condensing unit is placed outside the house, and the evaporator coil is inside. There is another configuration called a “packaged” air conditioner that combines the condensing unit and the evaporator coil into one outdoor unit (usually used for modular or mobile homes). Which type you should choose depends on your home’s location and construction. The typical SEER rating of air conditioners manufactured before 1992 is about 6.0. In 1992, the federal government established the minimum cooling efficiency standard for units installed in new homes at 10. The minimum SEER value changed again on January 23, 2006 to a SEER of 13. To be considered as high-efficiency units, air conditioners must have a SEER rating of at least 14. The federal government is in the process of increasing the minimum cooling efficiency standards again next year. The SEER rating is usually shown on a yellow and black EnergyGuide sticker attached to the outside unit of the air conditioner. Central air conditioners that are in the top 25 percent of efficient models may carry the Energy Star label. To qualify, they must have a minimum SEER efficiency level of 14. Additionally, Energy Star® models must also have a minimum Energy Efficiency Ratio (EER) of at least 11.5 for split systems, and of at least 11.0 for single-package models. Air conditioners that bear the Energy Star label may be twice as efficient as some existing systems. Few people think about how loud an air conditioner or heat pump will be – at least until the unit is installed and running in their back yard. With some units, the noise created by the condensing unit outside can even interfere with indoor peace and quiet. That’s why you should compare the sound levels produced by different models when you are shopping for a new unit. In the winter the normal heat pump system extracts heat from outdoor air and transfers it inside where it is circulated through your home’s ductwork by a fan. That’s why geothermal heat pumps are so efficient. From Montana’s minus 70 degree temperature, to the highest temperature ever recorded in the U.S. – 134 degrees in Death Valley, California, in 1913 – many parts of the country experience seasonal temperature extremes. A few feet below the earth’s surface, however, the ground remains at a relatively constant temperature. Although the temperatures vary according to latitude, at six feet underground, temperatures range from 45 degrees to 75 degrees Fahrenheit. That’s the principle behind geothermal heat pumps. In the winter, they move the heat from the earth into your house. In the summer, they pull the heat from your home and discharge it into the ground. Studies show that approximately 70% of the energy used in a geothermal heat pump system is renewable energy from the ground. The earth’s constant temperature is what makes geothermal heat pumps one of the most efficient, comfortable, and quiet heating and cooling technologies available today. While they may be more costly to install initially than regular heat pumps, they can produce markedly lower energy bills – 30-40% lower, according to estimates from the U.S. Environmental Protection Agency, who now includes geothermal heat pumps in the types of products rated in the EnergyStar® program. Because they are mechanically simple and outside parts of the system are below ground and protected from the weather, maintenance costs are often lower as well. As an added benefit, systems can be equipped with a device called a “desuperheater” can heat household water, which circulates into the regular water heater tank. In the summer, heat that is taken from the house and would be expelled into the loop is used to heat the water for free. In the winter, the desuperheater can reduce water-heating costs by about half, while a conventional water heater meets the rest of the household’s needs. In the spring and fall when temperatures are mild and the heat pump may not be operating at all, the regular water heater provides hot water. Surveys taken by utilities have found that homeowners using geothermal heat pumps rate them highly when compared to conventional systems. Figures indicate that more than 95% of all geothermal heat pump owners would recommend a similar system to their friends and family. Remember, a geothermal heat pump doesn’t create heat by burning fuel, like a furnace does. Instead, in winter it collects the Earth’s natural heat through a series of pipes, called a loop, installed below the surface of the ground or submersed in a pond or lake. Fluid circulates through the loop and carries the heat to the house. There, an electrically driven compressor and a heat exchanger concentrate the Earth’s energy and release it inside the home at a higher temperature. Ductwork distributes the heat to different rooms. In summer, the process is reversed. The underground loop draws excess heat from the house and allows it to be absorbed by the Earth. The system cools your home in the same way that a refrigerator keeps your food cool – by drawing heat from the interior, not by blowing in cold air. Geothermal heat pump systems are usually not do-it-yourself projects. To ensure good results, the piping should be installed by professionals who follow procedures established by the International Ground Source Heat Pump Association (IGSHPA). Designing the system also calls for professional expertise: the length of the loop depends upon a number of factors, including the type of loop configuration used; your home’s heating and air conditioning load; local soil conditions and landscaping; and the severity of your climate. Larger homes requiring more heating or air conditioning generally need larger loops than smaller homes. Homes in climates where temperatures are extreme also generally require larger loops. This type of loop is used where there is little yard space, when surface rocks make digging impractical, or when you want to disrupt the landscape as little as possible. Vertical holes 150 to 450 feet deep – much like wells – are bored in the ground, and a single loop of pipe with a U-bend at the bottom is inserted before the hole is backfilled. Each vertical pipe is then connected to a horizontal underground pipe that carries fluid in a closed system to and from the indoor exchange unit. Vertical loops are generally more expensive to install, but require less piping than horizontal loops because the Earth’s temperature is more stable farther below the surface. Although they are less applicable to California, there are other loop systems described at the Geothermal Heat Pump Consortium’s Web Site. These include an Open Loop System in which ground water is pumped into and out of a building, transferring its heat in the process; and Standing Column Well Systems, which can be up to 1,500 feet deep and can also furnish potable water. Because of the relatively high cost of electricity, electric radiant floors are usually only cost-effective if they include a significant thermal mass, such as a thick concrete floor, and your electric utility company offers time-of-use rates. Time-of-use rates allow you to “charge” the concrete floor with heat during off-peak hours (approximately 9 p.m. to 6 a.m.). If the floor’s thermal mass is large enough, the heat stored in it will keep the house comfortable for eight to ten hours, without any further electrical input (particularly when daytime temperatures are significantly warmer than nighttime temperatures). This saves a considerable number of energy dollars compared to heating at peak electric rates during the day. Electric radiant floors may also make sense for additions onto homes for which it would be impractical to extend the heating system into the addition. However, homeowners should examine other options, like a non ducted gravity wall furnace. So-called “wet” installations embed the cables or tubing within a solid floor and are the oldest form of modern radiant floor systems. The tubing or cable can be embedded in a thick concrete foundation slab (commonly used in “slab” ranch houses that don’t have basements) or in a thin layer of concrete, gypsum, or other material installed on top of a subfloor. If concrete is used and the new floor is not on solid earth, additional floor support may be necessary because of the added weight. You should consult a professional engineer to determine the floor’s carrying capacity. Thick concrete slab systems have high heat capacity and are ideal for storing heat from solar energy systems, which have a fluctuating heat output. The downside of the thick slabs is their slow thermal response time, which makes strategies such as night or daytime setbacks difficult if not impossible. Most experts recommend maintaining a constant temperature in homes with these heating systems. Due to recent innovations in floor technology, so-called “dry” floors, in which the cables or tubing run in an air space beneath the floor, have been gaining in popularity, mainly because a dry floor is faster and less expensive to build. But because dry floors involve heating an air space, the radiant heating system needs to operate at a higher temperature. Some dry installations involve suspending the tubing or cables underneath the subfloor between the joists. This method usually requires drilling through the floor joists in order to install the tubing. Reflective insulation must also be installed under the tubes to direct the heat upward. 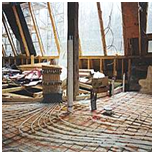 Tubing or cables may also be installed from above the floor, between two layers of subfloor. In these instances, liquid tubing is often fitted into aluminum diffusers that spread the water’s heat across the floor in order to heat the floor more evenly. The tubing and heat diffusers are secured between furring strips (sleepers), which carry the weight of the new subfloor and finished floor surface. At least one company has improved on this idea by making a plywood subfloor material manufactured with tubing grooves and aluminum heat diffuser plates built into them. The manufacturer claims that this product makes a radiant floor system (for new construction) considerably less expensive to install and faster to react to room temperature changes. Such products also allow for the use of half as much tubing or cabling since the heat transfer of the floor is greatly improved over more traditional dry or wet floors. Ceramic tile is the most common and effective floor covering for radiant floor heating, as it conducts heat well from the floor and adds thermal storage because of its high heat capacity. Common floor coverings like vinyl and linoleum sheet goods, carpeting, or wood can also be used, but any covering that helps to insulate the floor from the room will decrease the efficiency of the system. If you want carpeting, use a thin carpet with dense padding and install as little carpeting as possible. If some rooms, but not all, will have a floor covering, then those rooms should have a separate tubing loop to make the system heat these spaces more efficiently. This is because the water flowing under the covered floor will need to be hotter to compensate for the floor covering. Wood flooring should be laminated wood flooring instead of solid wood. 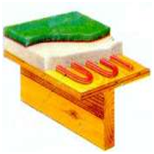 This reduces the possibility of the wood shrinking and cracking from the drying effects of the heat. Wall- and ceiling-mounted radiant panels are usually made of aluminum and can be heated with either electricity or with tubing that carries hot water, although the latter creates concerns about leakage in wall- or ceiling-mounted systems. The majority of commercially available radiant panels for homes are electrically heated. Like any type of electric heat, radiant panels can be expensive to operate, but they can provide supplemental heating in some rooms or can provide heat to a home addition when extending the conventional heating system is impractical. Unlike other types of radiant heating systems, radiant panels have very low heat capacity and have the quickest response time of any heating technology. Because the panels can be individually controlled for each room, the quick response feature can potentially result in cost and energy savings compared to other systems when rooms are infrequently occupied: when entering a room, the occupant can increase the temperature setting and reach a comfortable level within minutes. But as with any system, the thermostat must be maintained at a minimum temperature that will prevent pipes from freezing. Radiant heating panels operate on a line-of-site basis: you’ll be most comfortable if you’re close to the panel. Some people find the ceiling-mounted systems uncomfortable, since the panels heat the top of their heads and shoulders more effectively than the rest of their body.